Our sufferings today are the prelude of those you, Europeans and Western Christians, will also suffer in the near future.. Your liberal and democratic principles are worth nothing.. you are welcoming in your countries an ever growing number of Muslims.. you are in danger.. Your values are not their values.. you will become the victims of the enemy you have welcomed in your home. These are the prophetic words of Emil Nona, Chaldean Catholic Archbishop of Mosul, exiled in Erbil, having lost his diocese to Islamic radicals. We are in danger, he warned, though no Western bishop, archbishop, eminence or dean dared to repeat the admonition: no alarm was heard in Britain’s Parliament; no trumpet sounded in the pulpits of England. We pray for our brothers and sisters throughout the Middle East, but then gripe about Ched Evans and gawk at Gogglebox. We read about the estimable works of Canon Andrew White, and by scanning his Facebook feed and following him on Twitter we feel participant and cooperative in his ministry, without moving from our armchairs or contributing a penny to his mission. 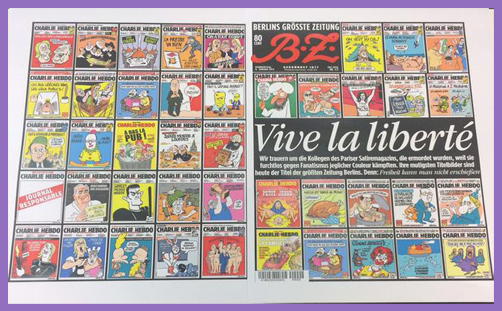 The heinous attack on the satirical magazine Charlie Hebdo was foreseen long ago. Their offices had previously been firebombed; their editor and cartoonists already threatened for daring to poke fun at religion and religious leaders (that is, Islam and Mohammed). 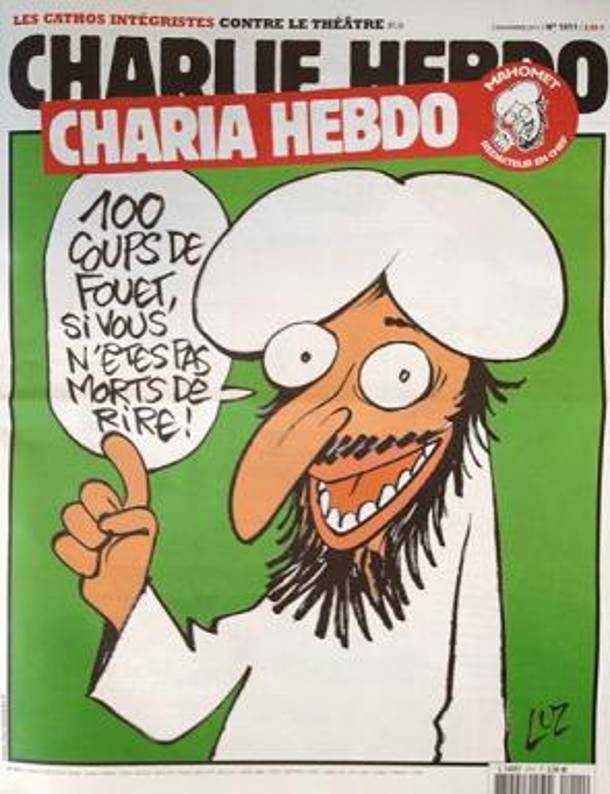 “I prefer to die standing than live on my knees,” said the magazine’s editor Stéphane Charbonnier. And so he did. RIP, Charb. The vast majority of Europe’s Muslims will be appalled that the name of Mohammed is once again smeared with the blood of innocents. But these cartoonists were not innocent to the ‘real’ or ‘true’ Muslims who seek societal purity and theological perfection. “We have avenged the Prophet Mohammed,” the attackers shouted. “Allahu Akbar!” they cried, as they assassinated the creative heart of Charlie Hebdo and murdered two policemen en passant, one of whom was a Muslim named Ahmed Merabet. He died fighting for la liberté, shot in the head at point-blank range for the freedom of France. RIP, Ahmed. The vast majority of Britain’s newspapers and TV channels have paid moving tribute to those who were massacred. Cartoonists have sketched their defiant tributes and declared eternal fraternité with their fellow creatives: the crayon is mightier than the AK-47. And so it should be in a liberal democracy which values its liberal and democratic values: there can be no artistic censorship, even for Mohammed. A free press must be free to speak the truth as it sees it, and cartoonists must be free to doodle their anti-Islamic illustrations along with their anti-Christian and anti-Jewish expressions of contempt. If an unbelieving cartoonist can’t blaspheme against religious belief without being stabbed, shot or beheaded, what karmic residue remains for the rest of us? It is painful to read some of the tributes being paid to those who died for the cause of satire, and those police officers who died defending the satirists. But it is more painful to read government platitudes of the need for “respect”, and media assertions about the “unacceptable” lampooning of religion (ie Islam). “It is Channel 4 policy to never show these or similar cartoons,” they boast, seemingly oblivious to their censorious submission to sharia precepts of blasphemy. How can they not distinguish absurd religion from the devout religious? Is the belief in prophethood inseparable from believers’ piety toward their prophet? Is the choice to believe the Shahada as incontestable as being born with brown skin? Why should they forbid the artistic satire of faith, as though we should all be compelled to kneel and bow to an abysmal array of illiterate prophets and defunct deities, without the freedom to distinguish religious truth from spiritual slander? If they can jape Jesus, caricature the Church, berate the Bible and parody the Pope, they must be free to ape Allah, mimic Mohammed and cuss the Quran. Some will think it awfully foul and hateful, if not bigoted and racist; others will call it critical and enlightened. But if we are not free to express religious hatred, our critical faculties are muted and we are not enlightened. The theological claims of Islam are neither self-evident nor indisputable. If a Muslim is free to contend that pigs are dirty and Mohammed was perfect, a non-Muslim must be free to demur, and the non-believing cartoonist must be free to juxtapose a muddy Mohammed with porcine perfection. If a Muslim is free to proclaim that singing is sin and dancing is of the devil, the unbeliever must be free to pipe hymns of praise and dance like David danced – even on the roads around the local mosque. If that is taboo, then our expression is hampered, our creativity is suppressed, our literature abridged and our art sterilised to conform to precisely the sorts of medieval prejudices and prohibitions we have incrementally discarded through centuries of reformation and enlightenment. If people of different faiths are to coexist peacefully and engage in the enlightened dialogue of conciliation, we must indeed be mindful of individual sensitivities and cultural differences. But respect for faith cannot be enforced where there is no belief. To insist that the unbeliever may not depict Mohammed, and to do so with a degree of inviolability verging on aggression, is to transgress a foundational principle of liberty. For if the unbeliever may not mock Mohammed, then the Muslim ought not to be free to refute the divinity of Christ. If criticising Islam is off-limits and Mohammed is to be immune from historical scrutiny, then so must be the truth-claims and prophets of all theistic traditions. And that, of course, would be absurd. With the freedom to pursue goodness and praise God comes the freedom to seek corruption and engage in acts of cruelty, dishonour and wickedness. With the freedom to express gratitude and the essence of benevolence comes the freedom to scorn, condemn, insult and offend. With the freedom to follow Jesus and tread the holy path of salvation comes the freedom to revile the man called Christ, desecrate the altars of the mind and laugh in the face of those who waste their lives on parables, myths and sky-fairies. This is humanity in its diversity. To live these freedoms without slaughtering each other is the very essence of civilisation. As our political rulers and religious leaders exhort us to “respect” Islam, and insist that the enlightened and “appropriate” response to the massacre of cartoonists is to be sensitive in the way we refer to Allah, Mohammed and the Qur’an, we must respond with an assertion of freedom – not to cause gratuitous offence, like shoving bacon sandwiches through the local mosque letter box, or burning a copy of the Quran in mindless protest against suicide bombings in Baghdad. To defend the freedom to publish offensive or blasphemous cartoons is to assert a fundamental value of liberal democracy. #JeSuisCharlie, we eagerly tweet to display our alliance of comradeship. But, for Allah’s sake, don’t share that hashtag unless you are really prepared to die for liberté, fraternité and solidarité. To die for one’s faith in Christ has become, sadly, a vocation of sacrifice for the many. The Charlie Hebdo massacre is meted out routinely if not daily upon Middle-East Christians and minorities in other Islamic countries. We now see that cartoonists are as vulnerable as Yazidis. We can’t say that Archbishop Amel Nona didn’t warn us.